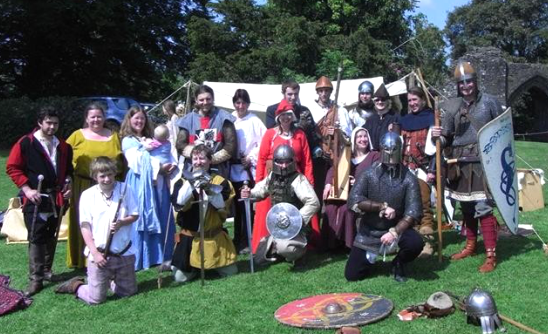 We are a group of people who are interested in understanding history through the re-enactment of it. We have a lot of fun not only fighting at shows all over the country with authentic weapons, but making and wearing authentic clothing, discovering what it was really like to live the lives of medieval Knights to Viking peasants. Membership comes from all over Cornwall and Devon. Basically we are a friendly bunch of people who love to dress up! We are always looking for new members and some basic kit can be made available to borrow for first timers. Fortnightly Battle Training in winter - training in the safe use of a range of weapons and fight techniques. Participation in battle re-enactments all over the country in summer. Living History - we are currently developing an authentic camp with weaving, cooking and crafts.